in mathematics, flat surface of infinite extent but no thickness. An example of a plane, or more exactly of a bounded portion of a plane, is the surface forming one face, or side, of a cube. A plane is determined, or defined, by any of the following: (1) three points not in a straight line; (2) a straight line and a point not on the line; (3) two intersecting lines; or (4) two parallel lines. Two straight lines in space do not usually lie in the same plane. For a given plane in space, a line can either lie outside and parallel to it, intersect the plane in a single point, or lie entirely in the plane; if more than one point of a straight line lies in the plane, then the entire line must lie in the plane. The simplest kind of two-dimensional surface, generated by the path of a straight line and defined by its length and width. The fundamental property of a plane is its shape and surface characteristics. one of the fundamental concepts in geometry. In a systematic exposition of geometry, a plane is usually considered as an initial concept, which is only indirectly defined by the axioms of geometry. Its characteristic properties include the following: (1) A plane is a surface such that every line connecting any two of its points lies entirely within the surface. (2) A plane is a set of points equidistant from two given points. Efimov, N. V. Vysshaia geometriia, 5th ed. Moscow, 1971.
a wood-shaving tool consisting of a wooden or metal stock, a cutter, and a wedge. The earliest planes, discovered in Pompeii, date to the first century A.D. Little use was made of the plane in ancient times and in the Middle Ages, the principal planing tool being the drawknife; widespread use of the plane began in the 15th and 16th centuries. 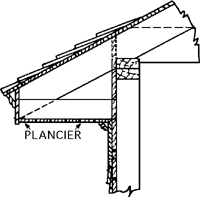 There are several types of planes, classified according to the type of planing (flat or profile planing), the stock size, and the cutter profile and angle adjustment. Jack planes are used for rough, flat planing with a rounded cutting blade. Single- and double-iron planes with chip breakers and trying planes, which are elongated and have two handles, are used for finish planing. Jointer planes and long planes, the latter distinguished by extreme length of the stock, are used for finish planing, for planing large, flat areas using a straight edge to check for the finish desired, and for fitting parts. Especially thin layers of wood are removed with smoothing planes. 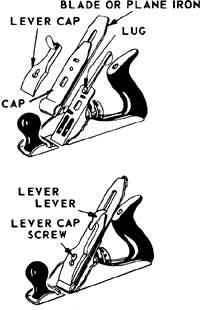 Toothing planes are used for making fine grooves on the surfaces of parts to be glued. Rabbets can be cut with rabbet planes and trimmed with fillister planes. Matching planes are used for making grooves, and router planes cut trapeziform slots against the grain. Irregularly shaped patterns on the faces of parts are worked with molding planes. Compass planes have a curved stock and are used in working curved (concave or convex) surfaces. Electric-powered hand planes are also used. Screen of magnetic cores; planes are combined to form stacks. A tool consisting of a smooth-soled stock from the face of which extends a wide-edged cutting blade for smoothing and shaping wood. A surface such that a straight line that joins any two of its points lies entirely in that surface. In projective geometry, a triple of sets (P, L, I) where P denotes the set of points, L the set of lines, and I the incidence relation on points and lines, such that (1) P and L are disjoint sets, (2) the union of P and L is nonnull, and (3) I is a subset of P × L, the cartesian product of P and L.
1. A tool for smoothing wood surfaces; consists of a smooth soleplate, from the under-side of which projects slightly the cutting edge of an inclined blade; there is an aperture in front of the blade for the shavings to escape. 2. A surface, any section through which by a like surface is a straight line. 3. Of a column, the surface of a longitudinal section through the axis of the column. 1. a tool with an adjustable sharpened steel blade set obliquely in a wooden or iron body, for levelling or smoothing timber surfaces, cutting mouldings or grooves, etc.